The title of Hajo Düchting's study of Paul Klee is Painting Music, a book that observes parallels in composed structures, rhythms, textures, flows, and colors of both arts and their mutual descriptive terms. Bibel's art, which also has a feeling of rhythm, shape, and play of hue, also at times has focused on musical themes directly. This page provides the subset of her Morphologies that concern music. Considering that every thing is a vibration or a rhythm, from photon to planet, from brain wave and arterial pulse to comet and sunspot cycles, the ambient soundscape too is music, as John Cage keenly demonstrated with his composed controlled accidents and his notorious 4'33". The soundless gap between notes, the silence, is the blank canvas in art, as full of energy and creative potential as the emptiness around atoms (from which virtual matter arises, interacts, and into which matter returns). When sound and silence become one, we have music, we have art. Flamenco: Siguiriyas y Soleares (2010), 36 × 36 in. (1) Colors. These are the standard flamenco hues....black, white, and teal. (2) Polka dots. Often, the woman flamenco dancer wears a dress with polka dots, which are representative of the numerous small round mirrors that adorn skirts and other clothing of Indians of the Punjab and of Rajasthan, traditional homelands of the Roma [Gypsies]. Originally from Persia, these mirrors are designed to ward off the evil eye. As it is probable that the Roma migrated to Andalusia via Persia and North Africa during the 16th and 17th century Mogul invasions of their Indian homeland, they are closer to their roots than their Central and East European cousins who immigrated centuries earlier. 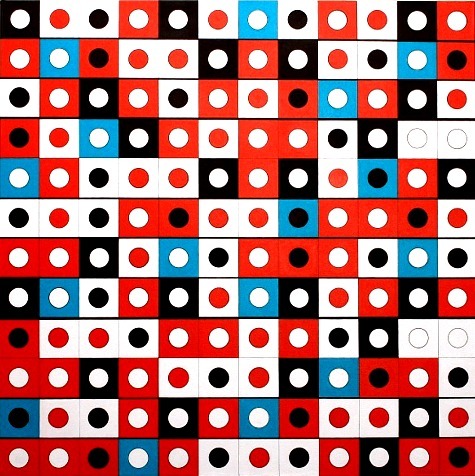 Certain combinations of colored dots are not used by flamenco performers, such as red dots on black or any teal dots. (3) The 12 columns. The major rhythm of older Gypsy flamenco — not the more Celtic or Andalusian folk fandangos sevillanas, and farrucas — are 12-beat, with various intermediate accents. 12-beat rhythms are ancient and still common tals in Hindustani music: ektal [6-6, or 2-2-2-2-2-2, or 4-4-2-2, which is specifically termed chau-tal]. This familiar 12-beat cycle may have continued among migrating Roma. (4) Soleares and siguiriyas are two flamenco forms of 12-beats. The rhythm of the siguirya, with colored accents, is 1-2 3-4 5-6-7 8-9-10 11-12. The soleá generally has the rhythm of 1-2-3 4-5-6 7-8 9-10 11-12. Two rows in the painting depict the soleá rhythm played by the guitar after the given introductory rhythm. This is 1-2-3 4-5-6 7-8 9 10 [11-12] with the last two being rests. Soleares and siguiriyas tend to be slower, more serious forms than the festive or faster bulerías and alegrias and tientas. Black squares or dots in the painting are accented beats. (5) Thus, a drummer or palmero (flamenco hand clapper) can look at the painting and play the flamenco rhythm, though this percussion is often in syncopation to the core guitar or dancer beat. (6) Viewing the painting, I trust you will perceive the music, the percussive stamping of the dancer, the energy and passion and also the gravitas. 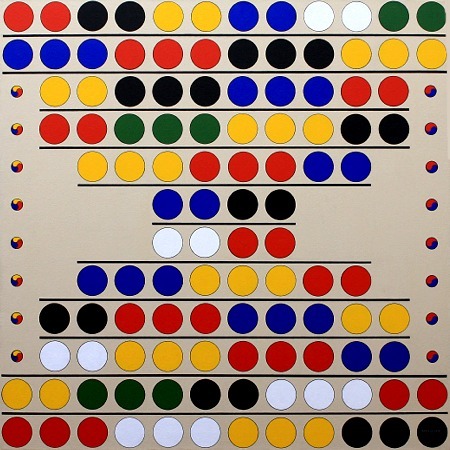 Pungmul Percussive Dance (2010), 30 × 30 in. Pungmul is Korean traditional rural, or farmer's, music and its dance formations, full of color and complex drum, gong, and sometimes shrill reed patterns. The repeats of hues on each row (2-2-2-2-2-2; 3-3-3-3; 2-3-3-2, 2-3-2-3-2; 3-3-2; and 2-2) indicate the rhythmic forms that occur in a suite. The shape of the painting suggests the hour-glass form of the chonggu drum, a chief element in Korean music. The circles are akin the colored flower pom-poms on some musicians' hats. Colors are traditional. Thelonious in Chau-Tal (2008), 36 × 36 in. 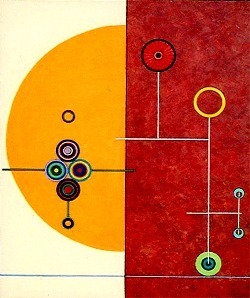 This painting depicts and evokes music and, like music itself, is rooted in mathematics. The jazz of Thelonious Sphere Monk is unique. He took 4/4 measures and divided their time irregularly with eights and sixteenth notes and rests and funky arpeggios, stretching and condensing interbar time yet always hitting the main beat. Tals are Hindustani rhythms of ragas that range from 5 matra [beats] up to 16 matra, divided into different patterns, such as the 10 matra jhap-tal, which can be divided as either 2-6-2 or 2-3-2-3 beats. While ek-tal is 12 beats, often split as 6-6, chau-tal is also of 12 beats but this rhythm is divided as 4-4-2-2. The painting has 12 rows, suggestive of standard 12-bar blues. Moreover, as geeks may have noticed, the use of circle and vertical bar follows the binary number system, such that the sum of the four sections across each row is 12. 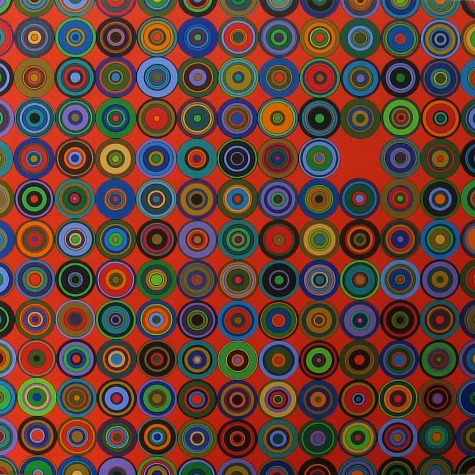 Like music, the painting is holistic without a focal point; it dazzles as the eye searches for relational patterns. The color juxtapositions are not random but gestaltic. As both jazz and ragas are improvisational within scales or modes and a root melody, this painting is similarly inventive within a fundamental grid, with objective, if achieved, of meshing with the humanity, essence, and spirit of these and similar musics. And then there is the serendipitous optical illusion of each row's fluidity and movement. 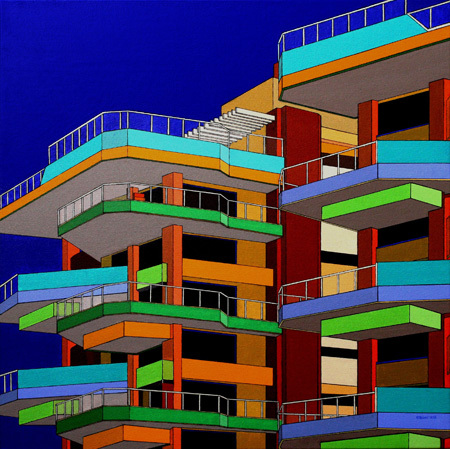 Choro (2013), 30 × 24 in. 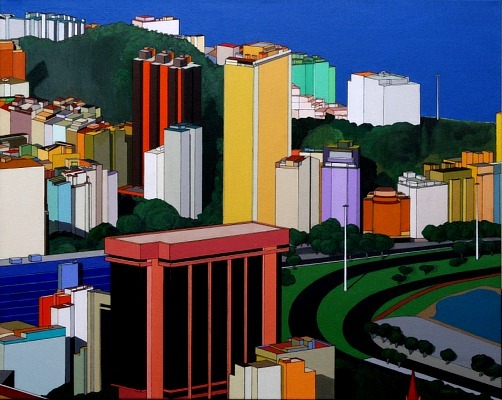 This mountain side view of Rio de Janeiro, Morro do Cantagalo down toward Ipanema, is dense, energetic, fast, and syncopated of flow like the old Brazilian musical form, choro, that took the European waltz, polka, and schottishe and combined them with African rhythm: sentimental Brazilian ragtime. The composition has three converging lines of buildings, much like the music. With its ensembles of 7-string violão guitar or 4-string cavaquinho, pandeiro tambourine, and solo instruments (as flute, bandolim mandolin, or saxophone), choro has never died and has becoming popular once again. 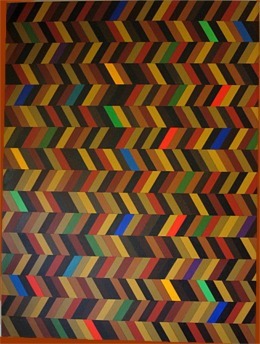 Samba (2013), 30 × 30 in. The light, playful, and bubbly Brazilian samba, its dance and music, is represented in this painting with its randomlike circle array, as happy a sight as a bunch of balloons at a fair. Festival de Fès (2006), 36 × 36 in. 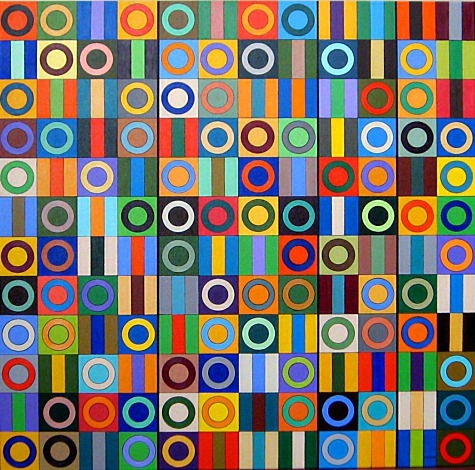 The pattern of circles represents vividly colored arabesque titles, which sometimes form circular arrays. The happy and mystical spirit of the Festival is evoked. The missing circle projects depth, as if the grid was a screen. 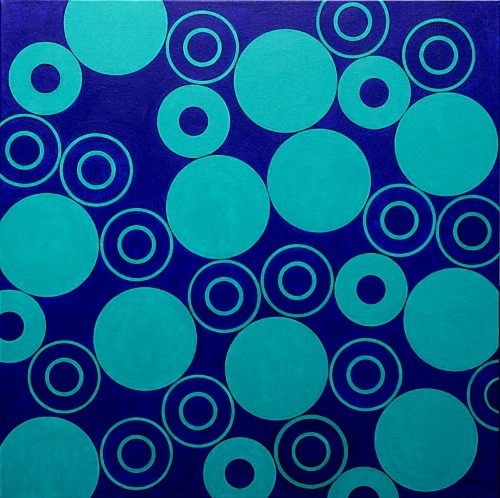 Fugue (2015), 24 × 24 in. Klee created a watercolor in 1921 with a similar title, Fugue in Red. The musicality of the architectural levels, shifting, and angles is obvious, and the use of such a contrasting array of colors emphasizes the contrapuntal repetition and interweaving of geometric shapes. 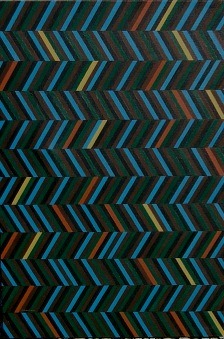 Music (2012), 20 × 16 in. The Chinese and Japanese have an ideogram that refers to music and sound. The painting has metaphysical basis: music is based on vibration and change, hence matter; the ancient's Music of the Spheres; and the cosmic AUM. 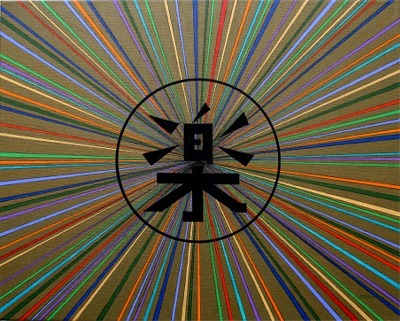 The painting also suggests The Big Bang and Genesis: in the beginning was the sound/word/light. 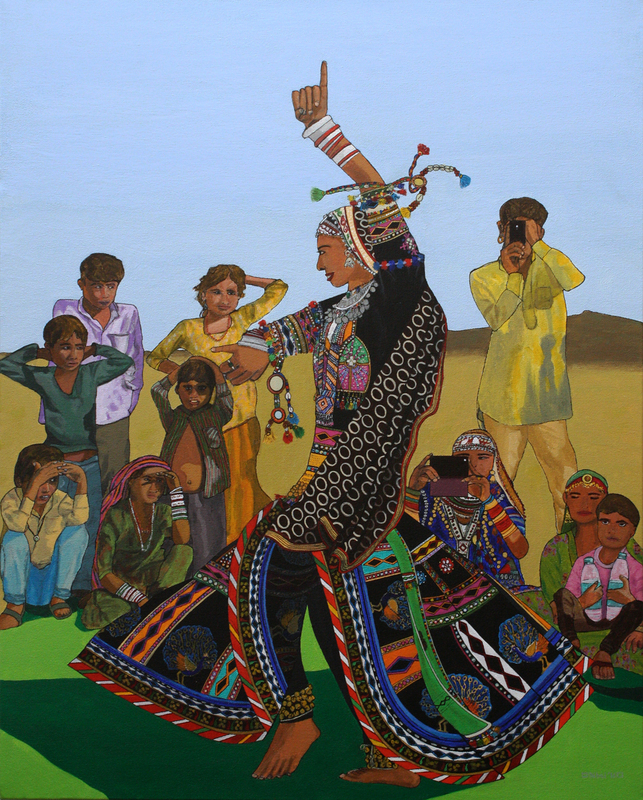 Desert Dance (2016), 24 × 30 in. My trip to Rajasthan, India, is the inspiration of this painting of very different style. Based on a photograph (found in my Rajasthan tour section) but with some small liberties as well as substituting the costume of the dancer, the depicted group are Roma in a desert encampment. The hand gesture, or mudra, represents happiness and wealth (not necessarily correlated). The pose is akin to that in Spanish flamenco, which was developed by émigré Roma, centuries ago. Piano keys are fairly obvious; and the blue ones are, of course, blue notes. The background wood is that of the instrument. The optical illusion is the jazz of reality. There are rules in ecosystems, and the color juxtapositions also obey governing principles. The bright colors are the organisms of this habitat and they flow and interact. Each line seems to undulate, though all are straight lines, and the overall optic illusion of depth also suggests change and movement. Euterpe is the Muse of music. The stained grain of the wood suggests night and water, as ripples and puddles. The blue circles are the musical blue notes and minor keys. They are a lens to the person's emotions. Frankye refers to my friend, Frankye Kelly, a jazz and blues vocalist. 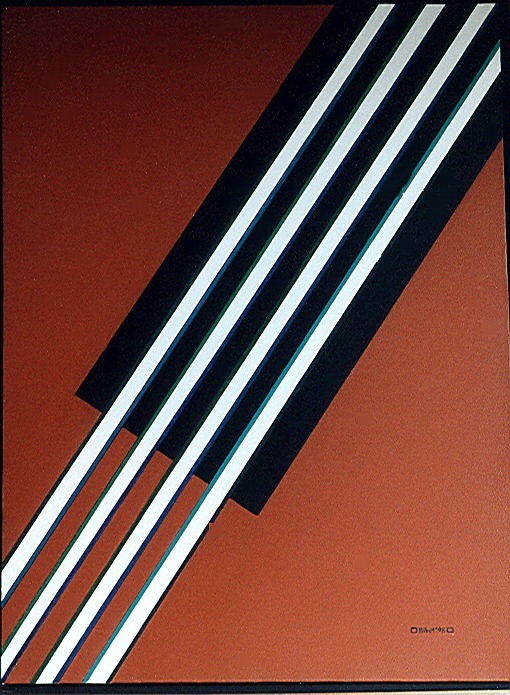 ’Round Midnight (2004), 24 × 36 in. The color scheme of dark blues and earth tones is a poetic and artistic interpretation of the song, written by Thelonious Monk. Music is indicated by the optical illusion of depth and movement. This painting is fairly obvious, being a close-up of a stringed instrument, specifically a cello. The title is suggested by the hues of the vibrating strings. 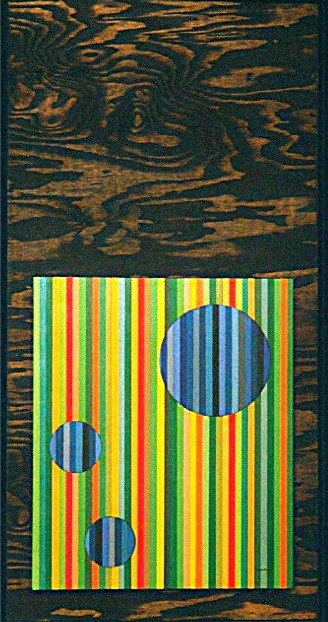 (2005), 24 × 30 in. The railroad of song had merged out of existence, but the cartoon tracks and [wind-up] locomotive are here, along with the hub of Atchison, the sunflower of Topeka, and the mystic cross of Santa Fe against a desert rising sun.